Received: February 22, 2017; Revised: April 26, 2017; Accepted: June 9, 2017; Published online: October 30, 2017. Current parameters of the Chicago classification include assessment of the esophageal body (contraction vigour and peristalsis), lower esophageal sphincter relaxation pressure, and intra-bolus pressure pattern. Esophageal disorders include achalasia, esophagogastric junction outflow obstruction, major disorders of peristalsis, and minor disorders of peristalsis. Sub-classification of achalasia in types I, II, and III seems to be useful to predict outcomes and choose the optimal treatment approach. The real clinical significance of other new parameters and disorders is still under investigation. The more comprehensive and more appealing to the eyes HRM plots provoked the imagination of esophageal physiologists to create new investigative parameters and reclassify esophageal motility disorders. This led to the development of an algorithmic scheme for the diagnosis of esophageal motility disorders in esophageal pressure topography plots, under the name of the Chicago classification.3 This allowed for improved recognition of motility disorders, and easier interpretation than conventional manometry line tracings. The aim of this study was to review the Chicago classification version 3.0, and assess the clinical implications of the parameters and disorders defined by this classification. HRM evaluates peristalsis by the distal latency (DL) which measures objectively the timeframe of the wave from the beginning of the swallow (upper esophageal sphincter relaxation) to an inflection of the peristaltic axis known as the contractile deceleration point (Fig. 3). Premature contractions are defined with a DL < 4.5 seconds. Fragmented contractions are considered segmental defects (break in the 20 mmHg isobaric contour > 5 cm) with normal contraction vigour. Table summarizes esophageal body parameters evaluated with HRM. The Chicago classification did not define parameters for LES length or basal pressure, but simply recommended assessment of pressure as an average of inspiratory and expiratory values for 3 normal respiratory cycles. Relaxation, however, is measured not by the nadir pressure as previously done with conventional manometry, but with the integrated relaxation pressure (IRP) that corresponds to the mean pressure of 4 seconds of greatest post deglutitive relaxation in a 10 seconds gap, triggered at the beginning of a swallow (Fig. 4). This metric compensates for diaphragmatic contraction during LES relaxation, and eliminates pseudo-relaxation due to movement artefacts. Abnormal intrabolus pressure corresponds to regions of esophageal pressurization > 30 mmHg. It may be panesophageal (whole esophageal body), compartmentalized (from the contractile deceleration point to the esophagogastric junction [EGJ]) or EGJ pressurization (between the LES and the diaphragm). Achalasia is defined by aperistalsis and abnormal LES relaxation (IRP > 15 mmHg). The disease is further classified into 3 subtypes (Fig. 5). Type I: incomplete LES relaxation, aperistalsis and absence of esophageal pressurization. Type II: incomplete LES relaxation, aperistalsis and panesophageal pressurization in at least 20% of swallows. Type III: incomplete LES relaxation and premature contractions (DL < 4.5 seconds) in at least 20% of swallows. EGJ obstruction is characterized by an impaired LES relaxation (IRP > 15 mmHg) with normal or weak peristalsis. Distal esophageal spasm (DES) is defined by premature contractions (DL < 4.5 seconds) in at least 20% of swallows with a normal IRP (Fig. 6). Hypercontractile esophagus (jackhammer esophagus) is characterized by DCI > 8000 mmHg·sec·cm in at least 20% of swallows and normal DL (Fig. 7). Absent contractility is characterized by aperistalsis in the setting of normal LES relaxation (IRP < 10 mmHg) (Fig. 8). Ineffective esophageal motility is defined by ≥ 50% ineffective swallows (failed or weak––DCI < 450 mmHg·sec·cm) (Fig. 9). Fragmented peristalsis is defined by ≥ 50% fragmented contractions with normal contraction vigour (Fig. 10). The Chicago classification may also help selecting the best initial approach for patients with achalasia. Kumbhari and colleagues13 reported that in patients with type III achalasia, clinical response was achieved more frequently after POEM (98.0%), as compared to LHM (80.8%) (P = 0.01). Recently, Khashab et al14 reported their experience with POEM for the treatment of 54 patients with type III achalasia refractory to medical therapy, and showed a 96.3% clinical success rate. Hence, while in type I and II achalasia both PD and LHM remain as good treatment alternatives, type III achalasia seems to be better managed with POEM, probably due to the ability to a longer myotomy of the thoracic esophagus. Overall, sub-classification of achalasia in types I, II, and III with the Chicago classification seems to be useful to predict outcomes and choose the optimal treatment approach for this motility disorder. The definition of EGJ outflow obstruction based solely on the IRP with the exclusion of achalasia allows this diagnosis to be superimposed to other diagnoses dependent of the esophageal body motility. It may be caused by an anatomical abnormality at the cardia (hiatal hernia, diseases of the esophageal wall, etc) or be idiopathic with normal anatomy. 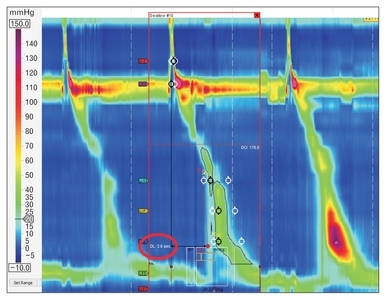 EGJ outflow obstruction is now recognized as a distinct entity in the Chicago classification. However, the real clinical significance of this diagnosis is still uncertain. In fact, it could be an early or incomplete expression of a variant of achalasia. Thus, the exact significance and clinical management of these patients remains unclear. Therapeutic options for ineffective esophageal motility are still limited, as no effective treatment is available to restore impaired esophageal smooth muscle contractility.27 Treatment directed towards GERD is helpful when dysmotility is secondary to this disease. The concept of fragmented peristalsis changed radically from previous versions to the version 3.0. Only large breaks (> 5 cm) with normal peristalsis are included. This is more clinically relevant, since incomplete bolus transit is observed in 100% of the cases of large breaks but only in 16% of small breaks.28 It is unclear how to treat this finding since there are no studies focusing on the treatment for this disease under these criteria. There are no studies evaluating changes in the motility pattern after therapy for GERD as well, since both conditions are frequently associated. HRM and the Chicago classification certainly contributed to a better definition of esophageal motility disorders. Particularly for achalasia, sub-classification in types I, II, and III seems to be useful to predict outcomes and choose the optimal treatment approach. The real clinical significance of other new parameters and disorders is still under investigation. Fig. 1. Normal high-resolution manometry plot (left) compared to the same swallow at the conventional manometry (right). Fig. 2. Distal contractile integral (DCI). 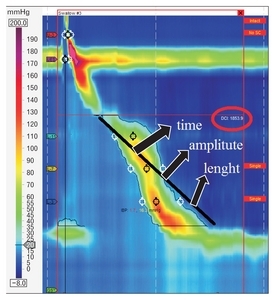 DCI value is calculated as the product of the mean amplitude of contraction in the distal esophagus (mmHg) times the duration of contraction (seconds) times the length of the distal oesophageal segment (cm) exceeding 20 mmHg for the region spanning from the transition zone to the proximal aspect of the lower esophageal sphincter. Fig. 3. 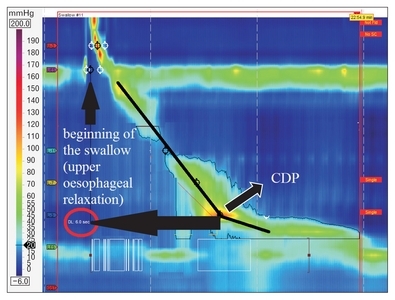 Distal latency (DL) measures objectively the time frame of the wave from the beginning of the swallow (upper esophageal relaxation) to the contractile deceleration point (CDP). Fig. 4. Integrated relaxation pressure (IRP) corresponds to the mean pressure of 4 seconds of greatest post deglutitive relaxation in a 10 seconds gap, triggered at the beginning of a swallow. Note diaphragmatic contraction pressure (*) during relaxation excluded from analysis. Fig. 5. Achalasia subtypes. Type I: absence of esophageal pressurization; Type II: panesophageal pressurization; Type III: premature contractions (distal latency < 4.5 seconds). Fig. 6. Distal esophageal spasm. Premature contractions (distal latency [DL] < 4.5 seconds) in at least 20% of swallows. Fig. 7. Hypercontractile esophagus (jackhammer esophagus). Distal contractile integral (DCI) > 8000 mmHg·sec·cm in at least 20% of swallows and normal distal latency (DL). Fig. 8. Absent contractility. Aperistalsis in the setting of normal lower esophageal sphincter relaxation (integrated relaxation pressure < 10 mmHg). Fig. 9. Ineffective esophageal motility. Failed or weak peristalsis in at least ≥ 50% of swallows. DCI, distal contractile integral. Fig. 10. Fragmented peristalsis. ≥ 50% fragmented contractions with distal contractile integral (DCI) > 450 mmHg·sec·cm. DCI, distal contractile integral; DL, distal latency. Author contributions: Francisco Schlottmann, Fernando A Herbella, and Marco G Patti planned conception and design, drafted the article, and approved the final article. Herbella, FA, and Patti, MG (2015). 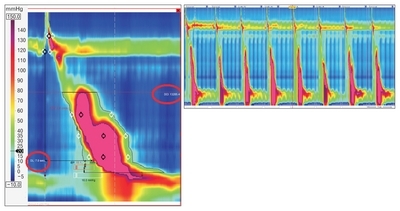 Can high resolution manometry parameters for achalasia be obtained by conventional manometry?. World J Gastrointest Pathophysiol. 15, 58-61. Herbella, FA, Armijo, PR, and Patti, MG (2016). Einstein (Sao Paulo). 14, 439-442. Kahrilas, PJ, Bredenoord, AJ, and Fox, M (2015). The Chicago classification of esophageal motility disorders, v3.0. Neurogastroenterol Motil. 27, 160-174. Roman, S, Pandolfino, JE, Chen, J, Boris, L, Luger, D, and Kahrilas, PJ (2012). Phenotypes and clinical context of hypercontractility in high-resolution esophageal pressure topography (EPT). Am J Gastroenterol. 107, 37-45. Richter, JE (2001). Oesophageal motility disorders. Lancet. 358, 823-828. Monrroy, H, Cisternas, D, and Bilder, C (2017). The Chicago classification 3.0 results in more normal findings and fewer hypotensive findings with no difference in other diagnoses. Am J Gastroenterol. 112, 606-612. Roman, S, Huot, L, and Zerbib, F (2016). High-resolution manometry improves the diagnosis of esophageal motility disorders in patients with dysphagia: a randomized multicenter study. Am J Gastroenterol. 111, 372-380. Herbella, FA, Moura, EG, and Patti, MG (2017). Achalasia 2016: treatment alternatives. J Laparoendosc Adv Surg Tech A. 27, 6-11. Pandolfino, JE, Kwiatek, MA, Nealis, T, Bulsiewicz, W, Post, J, and Kahrilas, PJ (2008). 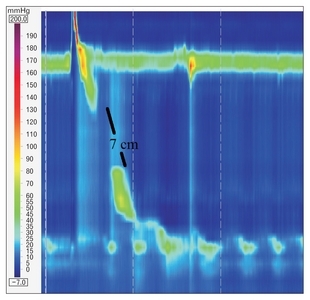 Achalasia: a new clinically relevant classification by high-resolution manometry. Gastroenterology. 135, 1526-1533. Salvador, R, Costantini, M, and Zaninotto, G (2010). The preoperative manometric pattern predicts the outcome of surgical treatment for esophageal achalasia. J Gastrointest Surg. 14, 1635-1645. Ou, YH, Nie, XM, Li, LF, Wei, ZJ, and Jiang, B (2016). High-resolution manometric subtypes as a predictive factor for the treatment of achalasia: a meta-analysis and systematic review. J Dig Dis. 17, 222-235. Kumbhari, V, Tieu, AH, and Onimaru, M (2015). Peroral endoscopic myotomy (POEM) vs laparoscopic heller myotomy (LHM) for the treatment of type III achalasia in 75 patients: a multicenter comparative study. Endosc Int Open. 3, E195-E201. Khashab, MA, Messallam, AA, and Onimaru, M (2015). International multicenter experience with peroral endoscopic myotomy for the treatment of spastic esophageal disorders refractory to medical therapy (with video). Gastrointest Endosc. 81, 1170-1177.
van Hoeij, FB, Smout, AJ, and Bredenoord, AJ (2015). Characterization of idiopathic esophagogastric junction outflow obstruction. Neurogastroenterol Motil. 27, 1310-1316. Scherer, JR, Kwiatek, MA, Soper, NJ, Pandolfino, JE, and Kahrilas, PJ (2009). Functional esophagogastric junction obstruction with intact peristalsis: a heterogeneous syndrome sometimes akin to achalasia. J Gastrointest Surg. 13, 2219-2225. Pérez-Fernández, MT, Santander, C, Marinero, A, Burgos-Santamaría, D, and Chavarría-Herbozo, C (2016). 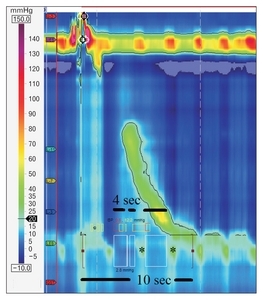 Characterization and follow-up of esophagogastric junction outflow obstruction detected by high resolution manometry. Neurogastroenterol Motil. 28, 116-126. DeLay, K, Austin, GL, and Menard-Katcher, P (2016). Anatomic abnormalities are common potential explanations of manometric esophagogastric junction outflow obstruction. Neurogastroenterol Motil. 28, 1166-1171. Herbella, FA, Raz, DJ, Nipomnick, I, and Patti, MG (2009). Primary versus secondary esophageal motility disorders: diagnosis and implications for treatment. J Laparaoendosc Adv Surg Tech A. 19, 195-198. Patti, MG, Gorodner, MV, and Galvani, C (2005). Spectrum of esophageal motility disorders: implications for diagnosis and treatment. Arch Surg. 140, 442-448. Leconte, M, Douard, R, Gaudric, M, Dumontier, I, Chaussade, S, and Dousset, B (2007). Functional results after extended myotomy for diffuse oesophageal spasm. Br J Surg. 94, 1113-1118. Roman, S, and Kahrilas, PJ (2015). Distal esophageal spasm. Curr Opin Gastroenterol. 31, 328-333. Hong, YS, Min, YW, and Rhee, PL (2016). Two distinct types of hypercontractile esophagus: classic and spastic jackhammer. Gut Liver. 10, 859-863. Patti, MG, Pellegrini, CA, Arcerito, M, Tong, J, Mulvihill, SJ, and Way, LW (1995). Comparison of medical and minimally invasive surgical therapy for primary esophageal motility disorders. Arch Surg. 130, 609-615. Herbella, FA, Tineli, AC, Wilson, JL, and Del Grande, JC (2008). Surgical treatment of primary esophageal motility disorders. J Gastrointest Surg. 12, 604-608. Menezes, MA, Herbella, FA, and Patti, MG (2016). Laparoscopic antireflux surgery in patients with connective tissue diseases. J Laparoendosc Adv Surg Tech A. 26, 296-298. Scheerens, C, Tack, J, and Rommel, N (2015). Buspirone, a new drug for the management of patients with ineffective esophageal motility?. United European Gastroenterol J. 3, 261-265. Herbella, FA, Tedesco, P, Nipomnick, I, Fisichella, PM, and Patti, MG (2007). Effect of partial and total laparoscopic fundoplication on esophageal body motility. Surg Endosc. 21, 285-288.